By day, I’m an office lady for a group of lively humanities departments. It’s a privilege to get to work with such a talented and diverse bunch, and I like knowing I’m supporting a vital but undervalued part of education. On the lighter side, I’m quite convinced that Christopher Guest could make a hilarious mockumentary about everyday life in my corner of academia. The ridiculous dramas and disparities have ranged from love triangles to budget crises, power plays to personality conflicts — to name just a few. One such moment arose recently when we found an unopened bottle of Chambord in quite an odd place, and it was clear that no one had claimed it. Raspberry liqueur at the office? We just weren’t sure what to do with it, let alone where it had come from. Inexpensive wine is as serious as it gets at our event receptions, so this unusual violet vessel was destined for somewhere different. I’d been itching to bake with raspberries again, and the newly-found spirits seemed meant to be transformed in my kitchen (then brought back to work to share in edible form, naturally). I decided on bite-sized meringues made with a Chambord syrup base, topped with tangy fresh berries and nutty poppy seeds. The outcome was wondrous: fragrant little treats with a lovely complexity and just the right amount of sweetness. Line cookie sheets with parchment paper (I use one large and two small); set aside. Place two oven racks respectively at top and bottom third of oven, then preheat oven to 200 F.
In a small saucepan, bring the liqueur to a steady simmer. Watching carefully, let simmer until reduced to 1/2 cup, occasionally pouring into a heatproof measuring cup to check amount. This should take about 5 – 10 minutes. Once you have 1/2 cup, turn off heat. 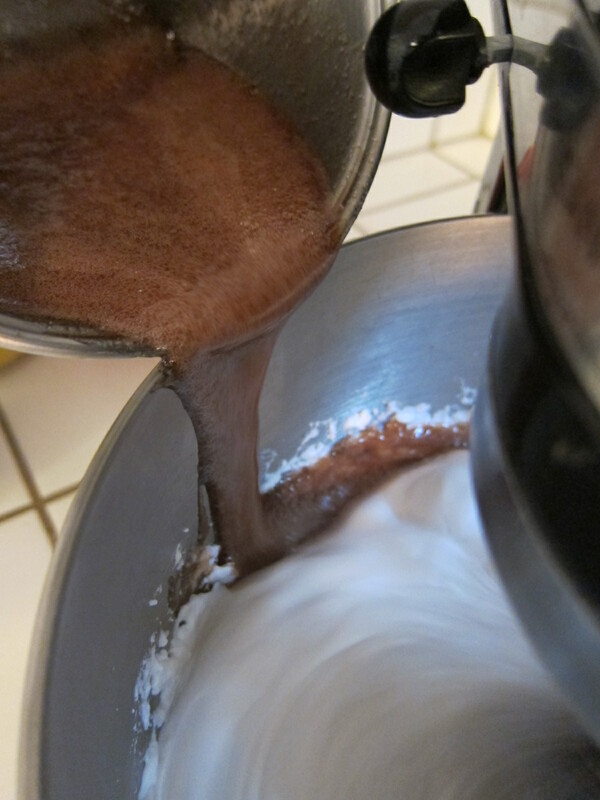 In the bowl of a clean stand mixer, beat egg whites on high. When they start to become white and foamy, gradually add 3 tablespoons sugar. Keep beating until voluminous, opaque, medium-stiff peaks have formed; turn mixer off and keep nearby. Fit a pastry bag with the piping tip of your choice, then fill with meringue. On the lined baking sheets, pipe out little meringue nests — each about 1.5 – 1.75 inches in diameter, and about 3/4 inch tall, with a centered hole big enough to fit a small raspberry. Refill pastry bag as needed, and feel free to be skimpy with the space you leave between the meringues. (While they shouldn’t be touching, they tend to hold their shape well when baked, and there are many to fit in the oven.) Sprinkle poppy seeds over meringues. Distribute the sheets of meringues onto the two racks in the oven, and set timer for 40 minutes. Switch cookie sheets from lower rack to upper rack, and vice versa, then close oven and bake for another 40 minutes. At this point, turn oven off and leave meringues inside for about an hour (not much longer lest they become gooey). Remove from oven. Meringues should feel dry and lukewarm to room temperature at this point. If they need more drying time, immediately return to oven (kept turned off) for another 10 minutes. Working quickly, carefully transfer cooled meringues to containers with lids, such as cookie tins. If you live in a humid area like I do, I recommend adding a few desiccant packets, perhaps borrowed from your vitamin or medicine bottles. Just when ready to serve, top each meringue with a raspberry, rinsed and well dried. Note: These meringues can become a bit sticky, particularly in less-dry environments, so you may want to set them out gradually. In tins at room temperature, they last up to 5 days, pre-berry-topped. Crisp and light with a whisper of boozy Chambord, raspberry poppy seed meringues offer a scrumptious harmony of texture and flavor. The fresh berries burst with a refreshing tang, while the salt and toasty poppy seeds balance perfectly with the sweetness. The flavor of the liqueur is not too robust, but notes of its warmth and fragrance are delightfully present. At the office and beyond, these addictive treats have proven to be a reminder that inspiration can show up in the most unexpected places. Maybe next time… Akin to mini pavlovas, these meringues would be lovely with with a spoonful of whipped cream (unsweetened or barely sweetened) underneath or on top of the berry — and this would also amplify the already complex play of textures. A bittersweet chocolate drizzle could also be divine. While the raspberries are a lovely echo of the liqueur within, feel free to swap them out for another fruit (e.g., blueberries proved a great alternative in one version I made, and I’m already dreaming up a grape rendition…). This entry was posted in Baking with Booze, Sweets and tagged baking, baking with booze, candy, chambord, chambord dessert, chambord recipe, cookies, dairy-free, dessert, gluten-free, liqueur, meringue, meringues, poppy, poppy seeds, raspberries, raspberry, raspberry liqueur, sweets. Bookmark the permalink. So funny and so true! Great post. We currently have a very old, large bottle of Brandy in our kitchen as well as a loads of left-over (cheap) commencement champagne and a nearly full bottle of crème de cassis! Last Friday we tested a punch recipe for the Fall Back-To-School Events! These Raspberry Poppy Seed Meringues sound scrumptious – hmmm…might this recipe work with our crème de cassis?! Thanks so much! Yes, how funny — this campus has all kinds of surprises and hidden treasures! I do think this recipe would work with crème de cassis; a currant version would be great. These look so wonderful, Butter Sugar Flowers! What a wonderful way to make use of the unexpected raspberry liqueur found at the office. I love the raspberries on top too! These are SO stinking cute!! and it makes a good use of the jar of rando poppy seeds I have sitting around in the pantry doing nothing. I love that you incorporated those!! I literally never have any idea what to do with them! These are like beyond cute! Thanks so much! I often feel the same way about poppy seeds, and in the past I’ve even wondered what their point is. But over time I’ve found that they balance out sweetness nicely (especially when they’re toasted/baked), and they also add a crackly little texture that can be pleasant. Cheers!